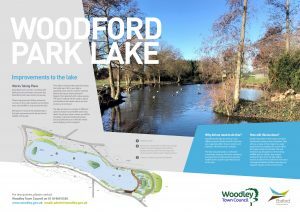 Over recent years, the Council has been working on a project to improve Woodford Park lake and its environs. We have appointed landscape architects LandShape Design and carried out various surveys on the water quality, surrounding trees and wildlife in and around the lake. Reduce overshading trees and hedging at the eastern end. Reinforce eroded banks with marginal planting. Utilise the silt to create reed beds and an area for native flowering plants. Create a platform and boardwalk through the new wildlife habitat. Improve the pathways and seating around the lake. We have been carrying out consultation with residents through our annual residents survey, online on our website and through on site consultation days held in April. The comments from this consultation can be viewed below. If you would like to make any comments about the project proposals please contact us or return a consultation questionnaire. We are also looking to include volunteers wherever possible so if you are interested in knowing more about the project or how to get involved, please get in touch. Consultation questionnaires can be returned by email to admin@woodley.gov.uk or by post to the Council Offices in the Oakwood Centre. 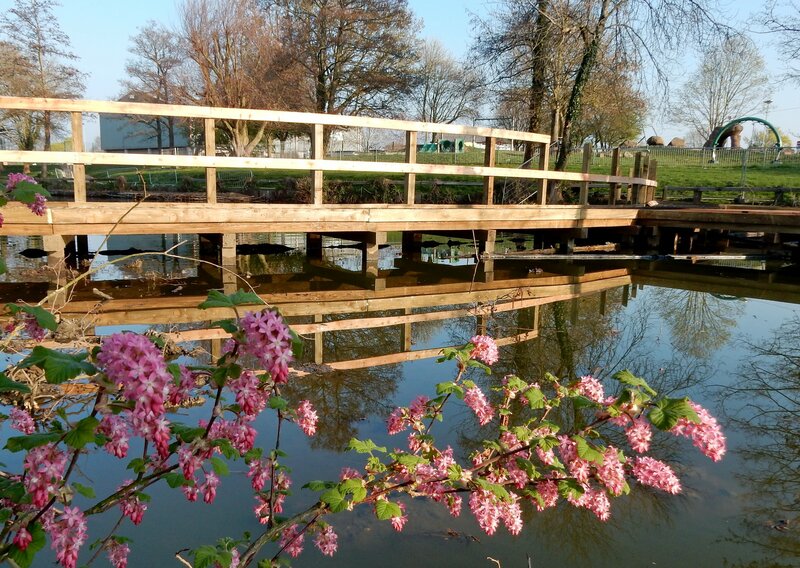 The mechanical work to move the silt and the construction of the boardwalk will be carried out from September 2018 into Spring 2019. In the meantime we have removed the overgrown hedge along the mound at the eastern end of the lake and are installing a retaining wall (approx. 1m height timber sleepers/retaining stones). This bank will then be planted with low-level shrubs creating a nice feature while retaining open views across the lake. We have also marked out the route of a lakeside path along the northern bank. 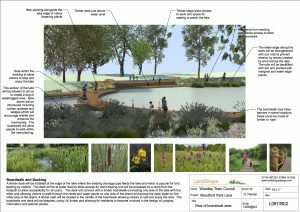 This accessible pathway will be a hogging / compacted gravel path with the lake on one side and wildflowers on the other and provide a pleasant alternative route around the lake. This path will be completed once the machinery work in the lake is complete. 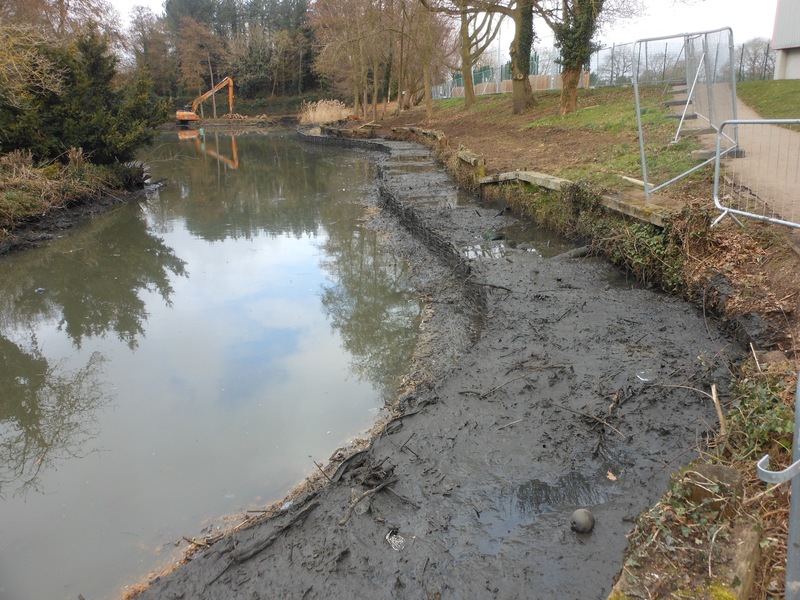 Woodley Town Council are tackling the build-up of vegetation and silt at Woodford Park’s lake with the help of specialist contractor Ebsford Environmental. 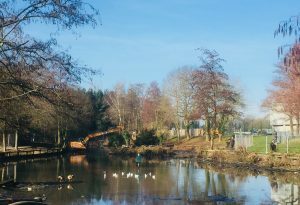 The Council aims to support existing wildlife, by improving the overall biodiversity of the environment, while making improvements to amenity value for visitors by providing accessible points for feeding the ducks and geese and also areas for pond dipping from a new boardwalk and deck. Ebsford are tackling the works and desilting using low impact ‘on water’ machinery, while the water remains in the lake to ensure there is no disruption to wildlife. Extensive surveys ahead of the project start have been carried out to identify what inhabits the lake and surrounding areas with an ecology management plan implemented to ensure precautions are taken to protect wildlife and safeguard long-term biodiversity benefits. 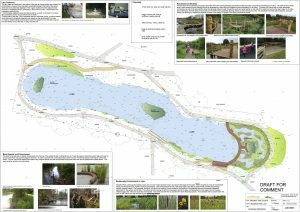 Information boards will be put up around the lake to provide information as the works are carried out. Leaflets will also be available from the Oakwood Centre and Woodford Park Leisure Centre. 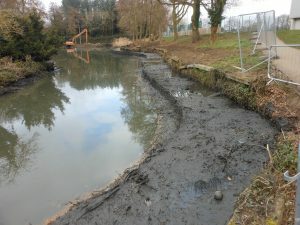 The ongoing regeneration of Woodford Park lake is well underway with the mechanical work by Ebsford Environmental to redistribute the silt throughout the lake now complete, creating a deeper area to enable the larger fish in the lake to continue to flourish and a shallow, boggy area to facilitate the growth of marginal habitat. 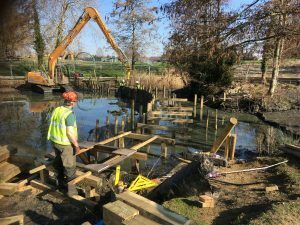 The scalloped area of the banks has also been completed, ready to begin work on the larger external banking areas, including the footpath and supporting boardwalk areas. Work is anticipated to begin next week. Elsewhere, the installation of the boardwalk is progressing to produce a fully accessible footpath for all users. While the rain has slowed down some of the work, it is helping to fill up the lake to previous levels. Once the levels are up and the additional bank work is completed, the team can then assess the environment to establish which marginal plants will enhance and create a more productive habitat for the local wildlife. Some sections of this will be repaired where possible. Other sections will become covered by the marginal planting where the banks have been extended and the timber is no longer at the waters edge. We will be constructing a new timber fence along a section from the end of the boardwalk along the north east bank – where the path runs close to the waters edge – (currently protected by heras fencing). This will be a hogging path which will be planted on either side (marginal water plants on one side and wildflowers on the other). This path will be laid before the end of April. We will be planting out the extended section of the western island with reeds and other areas with a mix of native species. We are currently sourcing plants and also seeing what comes up naturally some areas. The planting will be an ongoing effort over the next few growing seasons as areas become more established. Initial planting will take place over the next few weeks and we will be looking to involve volunteers once we have some dates. The contractor will also be installing brushwood faggots along the silt reinforcement membrane throughout March. The mechanical work in the water was completed at the beginning of March and was scheduled to take place early in the year to avoid the nesting season. Some mechanical work will be carried during the remainder of March on/near the banks but not in nesting areas. The manual work on the boardwalk will also be completed this month and planting work will not impact on nesting birds, which will be undisturbed on the western and central islands. Once the marginal planting establishes it will provide more habitat for nesting birds. The logs on the central island had been arranged to provide natural nesting shelters and these were used last year by nesting birds. We anticipated some damage to the pathways as a result of the work. The paths will be repaired and surface dressed as part of the project and we are talking to the contractor about the dates for this work. In the meantime some temporary repairs will be carried out in the next couple of weeks. 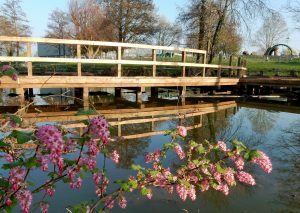 Great progress in being made on the developments and improvements to Woodford Park lake, with the boardwalk across the lake now complete. However, there will be some restrictions in place throughout the year, in order to protect the wildlife. Access to the small island will be restricted through the nesting season (March-August) by way of a barrier/information board explaining this. Access to the island will be opened up again from August/September. Signage will be installed requesting that dogs be kept on a lead on the boardwalk and feeding platform and that children are accompanied by an adult at all times. Additional information will be provided regarding feeding of the ducks and wildfowl.